This Yamaha YDP-V240 review is going to help you to learn everything that you want to know about this interesting digital piano. The first thing you notice about the YDP-V240 is that it is not what you would expect. Yamaha has spent many years becoming a leader in both acoustic pianos and digital pianos. They have come up with some pretty innovative designs and the Yamaha Arius YDP-V240 is a really good example of their innovative design team’s abilities. When most people think of a digital piano they think of a thin cased instrument that is almost flat and that can easily be transported from one location to the next. The Arius is not quite what you would expect as far as being portable. It is not a transportable stage piano. It looks more like an upright piano than a portable stage piano. This is a stationary digital piano that has a really beautiful wood cabinet. The piano is about the size of a small upright once it is assembled. It absolutely has a pretty amazing presence and can easily be mistaken for an upright until you notice all of the many controls than you realize that you are looking at something very different. Yamaha has done an excellent job of combining a much loved traditional look with modern technology to create the YDP-V240. There are plenty of features that you will fall in love with on the YDP-V240 like the nice big LCD screen in the middle of the keyboard. The mono chromatic screen is of ample size and easy to see so you do not have to squint trying to choose programs and arrange settings. The backlight LCD screen is easy on the eyes and will enhance your playing experience. All of the controls are within easy reach so you do not have to interrupt playing to adjust settings. The design of the control panels is very well thought out and extremely user friendly. When Yamaha says “intuitive” what they are really saying is “anyone can master this instrument with just a little bit of effort”. The controls are ample but they are by no means overkill or confusing. The Yamaha YDP-V240 offers the Yamaha’s graduated key system which gives the keyboard a very natural feel that makes transitioning from acoustic to digital very easy. The GHS offers the great hammer action that you find in acoustic pianos and some top-rated digital pianos. You can actually adjust key sensitivity to your own personal style which is a nice feature that really gives this instrument a customized feeling. These fully wooden keys are weighted just perfectly and since you can adjust the sensitivity to personal preference they actually are more comfortable to use than traditional or acoustic piano keys. It has the Advanced Wave Memory Stereo Sampling Technology as well. This technology allows the YDP-V240 to keep up with your key strokes nicely and produce excellent sound. Speaking of sound, the Yamaha YDP-V240 offers a combination of over 500 different musical instrument sounds. It may sound like an excessive amount of sounds but even if you do not see yourself using all of them it is always nice to have them available. The built in speakers are powered by 20W amps so they are nice and powerful and really emulate the sound wonderfully. The 64 note polyphony is ample enough to handle whatever you can throw at it. The layering function is incredible and is an easy option to layer different instruments together and get a really unique one of a kind sound. This digital piano really is a dream of any composer or player because while it is easy to stay focused and practice it is also tons of fun to play with. You will find yourself in a creative zone like you have not been in, in a while because literally everything that you need to create is right at your fingertips. As if the sounds capabilities were not enough you also have a full range of sound effects which is delivered via the Digital Signal Processor or the DSP. There are 35 types of reverbs a 44 types of chorus sounds besides the 238 effects that are offered with the DSP. All of the sound effects can be applied to the all the voices. You can pull down your favorite songs from the extensive library data base or use the USB to access an external library. The YDP-V240 offers everything from soup to nuts. It has the Yamaha Easy Song Arranger and the Yamaha Performance Assistance Technology. Both allow you to play perfectly each and every time you sit down at the keyboard. Connectivity is a non-issue as well. The Yamaha Arius YDP-V240 can easily function as a good MIDI controller. It offers easy USB hookup to exterior devices that you can record to and play from. This digital piano is all about convenience and performance. It sounds like a grand piano, looks like an upright and performance like a complete orchestra. A review of the Yamaha ARIUS YDP-V240 would not be complete without talking about the stunning cabinet that is an integral part of this setup. The cabinet is solid wood and is more furniture than it is a cabinet for the keyboard. The rich rosewood cabinet also has a sliding key cover that will prevent dust and dirt from building up on the keyboard. When it is all closed up it instantly blends into any room and looks like a high end piece of furniture. There is a built in music stand in the traditional upright piano style. The cabinet for this digital piano is simply lovely. This is a beautiful instrument but would not be ideal if you are looking for something that can travel with you. This is a heavy instrument that is large. It is not something that you will want to move around a lot once it is assembled. That is the other downside. You do have to assemble the cabinet and put together parts of the instrument. You may also want to consider putting it together in the area that will be its permanent home so that you do not have to move it once it is assembled. It also would be nice if a bench was included with the set but it is not so you do have to purchase the bench separately which is not unusual but it would be nice if Yamaha threw the bench in with the purchase. There is really nothing bad to say about the Yamaha YDP-V240 when it comes to performance but it is not ideal for all situations. If you are looking solely for a practice digital piano that you can take with you, this is not it. But if you are looking for the best home digital piano, than this is it! This is ideal for a permanent home in your home or your studio. It would also be ideal as a permanent installment in a church choir or other venue. If you want a nice balance between an upright with a baby grand sound that can offer a lot more than you want the Yamaha YDP-V240. It is a great instrument that also looks fantastic. It is not quite as large as an upright so it makes an excellent option if you want an upright but would not be able to navigate it upstairs or you need something a bit smaller to save space. Of course it is also much more cost affordable than an upright. It’s not going to be a cheap digital piano, but you can save some money with it. It has to be mentioned again that this is not a portable model. You cannot remove the keyboard from the cabinet to take with you. Once it is assembled, it is assembled and likely will need to stay where it is. It is not overtly heavy but it is heavy enough to where you would not be able to move it on your own. 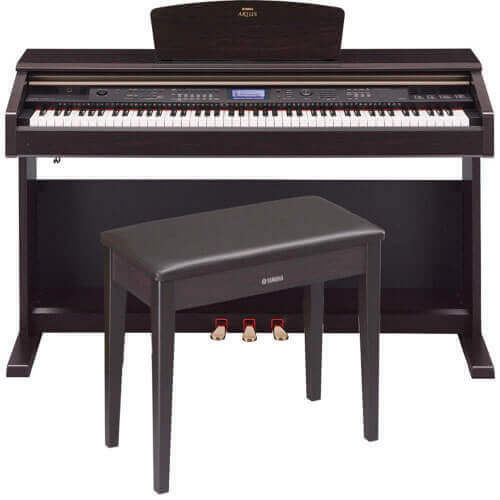 It is a great option for anyone that wants a really full featured digital piano that has a furniture quality cabinet because it can easily enhance any décor. Most users have highly recommended the Yamaha YDP-V240 and have commented positively on both the sound and the usability. Of course everyone that sees this digital piano is greatly impressed by the look. The cost different between this digital piano and an upright of this quality is tremendous. An upright from Yamaha that has a cabinet of this caliber would easily cost 10 times or more what the Yamaha Arius YDP-V240 costs. It is a really great compromise for anyone that always dreamed of owning an upright but could never quite find the money or the space. 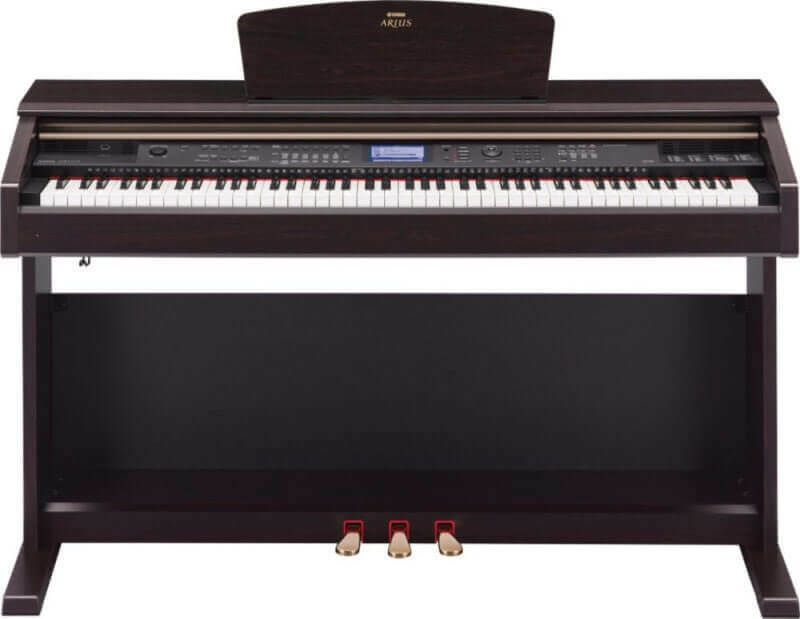 Frankly because of all of the added features and the true piano 88 keys many people feel like that the Yamaha YDP-V240 is a better overall choice over an upright.